To wish one were reading a novel rather than an academic monograph is an all-too-frequent desire; it is a much more peculiar experience to wish for a novel to turn into a monograph instead. Julia Kristeva’s sprawling, 600-page novel, Teresa, My Love, an “imagined life” of the 16th century mystic of Avila, Spain, first published in French in 2008 and recently translated into English by Lorna Scott Fox, presents a rare example of the latter. Throughout the book, a thinly veiled alter-ego of Kristeva herself—a psychoanalyst named Sylvia Leclerq, an atheist and author of a book on Marguerite Duras—becomes obsessed with Teresa’s inner and outer lives. published the influential avant-garde magazine Tel Quel. Often identified in American academic circles as one of the so-called “French feminists” alongside Luce Irigaray and Hélène Cixous, Kristeva’s work has often eluded neat categorization; she moves deftly from theoretical musings to clinical case material to literary analysis. But while heedless of conventional generic boundaries, her work, ranging from the early Revolution in Poetic Language to the trilogy of the 1980s, Powers of Horror, Tales of Love, and Black Sun, to her more recent trilogy on “female genius” (which includes volumes on Hannah Arendt, Melanie Klein, and Colette), has always been preoccupied with the role of bodily drives within language. Kristeva’s oeuvre has also been marked by a fascinated ambivalence about religion, and particularly Christianity. Kristeva’s fictional Sylvia shares these fascinations. In Teresa, My Love, Sylvia serves less as a character than as a device, a way for Kristeva to bring Teresa into today’s world and put her on the analytic couch. The novel is a multi-pronged attempt to do so, undertaken in a mélange of genres, and it creates a thoroughly disorienting experience for the reader. There are close readings of Teresa’s writing; a narration of Sylvia’s pilgrimage to key sites from Teresa’s life; snippets of Sylvia in Paris with her patients; e-mail correspondence between Sylvia and a Cervantes scholar about “Teresa and Miguel”; highly technical psychoanalytic explorations of the “beaten father” of Christianity itself by way of a detour through Freud’s “A Child is Being Beaten”; a four-act play set at Teresa’s deathbed with surprise cameos by Leibniz, Spinoza, and the Voice of His Majesty the Lord; and finally a letter from Sylvia to Diderot, all interspersed with historical, biographical, and psychobiographical material, frequently written in the second person and addressed to Teresa herself, although it is Teresa’s own life that is being thus narrated. 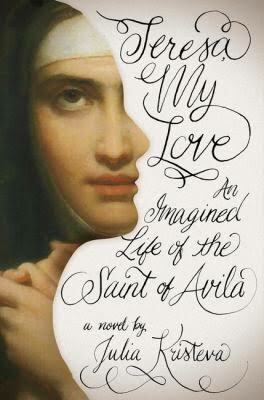 The “Teresa, my love” of the title is Sylvia’s continual, incantatory refrain. It is a refrain she adopts as she takes Teresa in as a “roommate” who increasingly takes up all of Sylvia’s own psychic space. She sounds Teresa’s depths in contrast to what she takes to be the shallowness of modern culture, for which the contemporary French literary scene functions as a convenient synecdoche. In so doing, Sylvia allows Kristeva to advance several theses, some explicit, some less so, some controversial, some less so. It’s hard to quarrel seriously with the first two of these theses, or with the impulse to insert the 16th century mystic retroactively into the respective lineages of psychoanalysis and the Western philosophical tradition. For Kristeva is not making historical claims in either case; she is essentially at play in the imaginative realm, setting Teresa into conversation with a variety of interlocutors, sometimes to happy effect, as with the provocative claim about Teresa as intersubjective thinker, sometimes less convincingly. For instance, in the argument about Teresa as prefiguring Freud, Kristeva is most persuasive when she confines her argument to Teresa’s own writing. At times she allows this claim to slip uncomfortably into an argument about mysticism more generally, the purest expression of which she finds in Christianity, and thence to be elided into Christianity itself, for which she claims a unique and universal status as a “laboratory for modern psychology and even psychoanalysis.” This move is even more discomfiting in light of Kristeva’s treatment of Islam via a few throw-away lines about “suicide bombers” who “twist their alleged faith into murderous nihilism,” along with an early walk-on role for a pretty young IT engineer whose insistence on wearing a head scarf to symbolize her union with God is pathologized by Sylvia’s secular colleagues and dismissed by Sylvia herself as wholly different from Teresa’s faith. In the case of the third thesis about the contemporary need for what Teresa represents: without disdaining either the desire to cultivate psychic space or the worry about its impoverishment, the form in which it is expressed strikes me as somewhat disingenuous, evoking a nostalgia for a time that never was. I am prepared to agree to Teresa’s merits, but not to concede that we today are so shallow as all that. 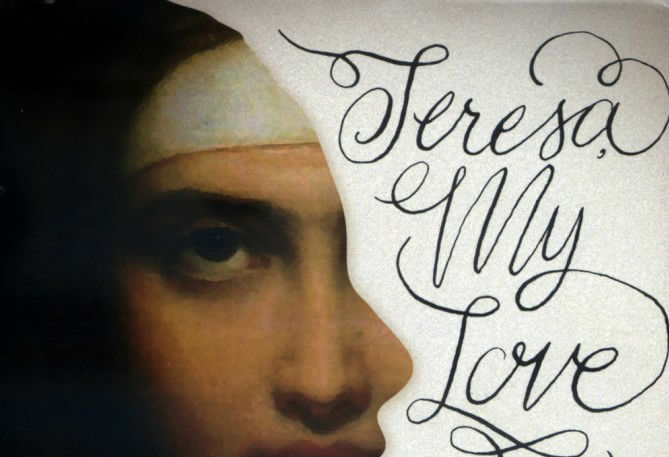 I wonder if Teresa, My Love, is intended as, if not precisely a magnum opus, then a culminating work of sorts: it gathers together a series of preoccupations that span the many years of Kristeva’s theoretical writing. Yet it also contains a degree of self-referentiality that is first amusing, then ludicrous, and finally off-putting. Kristeva’s own life and work are name-checked throughout, both tacitly, as phrases (“the black sun of melancholia,” “new maladies of the soul,”) and explicitly: Sylvia took a course with Julia Kristeva at Columbia University; Sylvia mulls the relationship of Teresa’s visions to Kristeva’s notion of “the semiotic”; even the work of Philippe Sollers, Kristeva’s husband, makes an appearance. I remain convinced that Kristeva is one of the most important of the twentieth century French theorists; I find much of her work indispensable, from her early writing on the semiotic and the symbolic to the “trilogy” of the 1980s on horror, depression, and love, which includes brilliant analyses of a variety of medieval and other Christian sources in her Tales of Love. Thus Teresa, My Love arrives as a disappointment and, indeed, as a source of confusion, as it adds nothing to ground that has been already well-trodden, whether by Kristeva herself in the ‘80s or, more recently, by figures like Amy Hollywood, who thoroughly explored French intellectuals’ peculiar obsession with female medieval Christian mystics in her 2001 book Sensible Ecstasy. Nor is Teresa, My Love redeemed by its merits as a novel. Stylistically, it is both overwrought and overwritten in a manner that clearly strives toward performativity but stops well short of it, landing somewhere in the neighborhood of didacticism. Sylvia as a character is so undistinguished that she will live forever in my memory characterized by a single detail—she has been so thoroughly psychoanalyzed that she has forgotten the name of her former long-term romantic partner—a detail I flagged, fascinated, on page 24, that never came up again. And most peculiarly, despite the length of the book, its degree of detail, and Kristeva’s obviously meticulous research in multiple languages, the character of Teresa never truly comes to life here on the page. Psychoanalyst Jacques Lacan famously told the audience of his twentieth seminar to go to Rome to see Bernini’s Ecstasy of St. Teresa to understand the truth of feminine jouissance through mystical experience: “she’s coming, there’s no doubt about it.” Luce Irigaray later quipped that in order to learn about her pleasure, it might be of more use to read the work of “the Teresa in question,” a remark that is likewise applicable in the case of Teresa, My Love. Indeed, the best outcome that I can imagine for the book is that it might prompt readers to go read Teresa herself, whose own writing, cited liberally throughout, is all the more pellucid in contrast with Kristeva’s endless sea of modifiers and second-person soliloquies. Kristeva quotes Teresa, herself quoting Psalm 102, reflecting upon the desire for God in his absence: “Vigilavi, et factus sum sicut passer solitarius in tecto [I watch, and am as a sparrow alone upon the housetop].” By the end of this hectic novel, such a solitude, monastic or otherwise, would come as a profound relief. Abby Kluchin is Visiting Assistant Professor of Philosophy and Religious Studies at Ursinus College and Associate Director of the Brooklyn Institute for Social Research.